Parasitology Testing Europe Ltd based in Wakefield, UK is the European distributor for the Parasitology Centre, Inc. (PCI) in Scottsdale, Arizona. PCI Europe was founded by Emma Lane, who has worked extensively over the last 10 years with human parasite, fungal and bacteria infections. PCI Europe enables those living in Europe to utilise the worlds most advanced, consistent and well researched laboratory, the PCI, Arizona, led by world renowned parasitologist, Dr Omar Amin, for the detection and treatment of parasitic infections. Parasitology Center, Inc. (PCI) in Scottsdale, Arizona is a research facility of parasites of the intestinal tract and organ systems including the skin. Due to the spillover of infectious agents and parasites from wildlife and parasites in dogs and other domestic animals into human populations by a wide variety of environmental exposures, PCI has the expertise in all these biological systems. This is because of Dr Amin’s broad zoological experience and research history in Africa, the middle East, Asia, and the Americas. Established in 1994, PCI is a facility that has excellent national and international reputation as one of the best, if not the best, parasitology laboratory in the country. We work with hundreds of professionals, many of whom are alternative health practitioners, in all seven continents. Take a look at our testimonials. Emma is a Naturopath and Naturopathic Nutritionist who has devoted 25 years of her career to helping people achieve optimal health and wellbeing. She is an international teacher and lecturer on a variety of subjects including gastrointestinal disorders and parasite infection. She practices out of London’s Harley Street district as well as in her county, Yorkshire, where she is highly renowned for helping those with the most challenging of health issues. 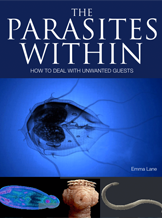 Emma's fascination with parasites occured early on in her career when working with clients with chronic health conditions and ailments. Looking deeper into potential causative factors, Emma discovered these clients had unwanted problematic parasites, fungus and bacteria, and as a result developed strategies to eradicate them. Once eradicated, clients reported significant health improvement. Emma has extensively studied around the world seeking the foremost authorities in fields such as parasitology, naturopathy, nutrition, gastrointestinal disorders, mental/emotional wellbeing, NLP, hypnotherapy, Time Line Therapy and acupuncture. Emma is a member of the General Naturopathic Council (GNC Ltd), MBANT, Naturopathic Nutrition Association (NNA), Royal Society of Medicine (RSM), Institute of Functional Medicine (IFM) and the Association of Naturopathic Practitioners (ANP). Graeme is a physiologist who has spent the last seven years working in the private health sector helping a wide variety of clients to optimise their health. Based in the Harley Street district, Graeme works alongside a team of GP’s, surgeons, psychologists and alternative health practitioners delivering bespoke advanced health assessments and optimisation programmes. Graeme’s strong interest with parasites started when he noticed a correlation between ill health, poor physiological test results and positive laboratory detection of parasites. Graeme also works proactively with a number of corporate organisations and professional golfers, supporting their health and wellbeing ensuring disease and sub-optimal performance are kept at bay. There are two parasitologists on board at the PCI. Dr Omar M. Amin . , Ph.D., founder of PCI, is a Professor of Parasitology. He is a nationally and internationally recognised authority in the field with over 180 major articles/books published in American and foreign professional journals on human and animal parasites from North America, North Africa, Peru, Persian Gulf, Kenya, Czech Republic, Russia, Inner Mongolia (China), Thailand, Taiwan, and Vietnam. Dr. Amin has conducted many international parasitology workshops and conferences including one in the Persian Gulf as a Fulbright Scholar and had received many other honors, awards, and Parasitology research grants. He has authored a 5-part educational video series on "Parasitic Infections of Humans, Diagnosis and Pathology" produced by the Center for Improvement of Human Functioning International of Wichita, Kansas. The other parasitologist at PCI is Mr. Ronald Mann who is a top veteran parasitologist who has been practicing clinical and bench top parasitology and microbiology for over 40 years; first with the U.S. military in Asia and currently with a Phoenix hospital and PCI. He is involved in research and participates in scientific meetings.